If you've never thought to yourself, "Hey, you know, a woman in her sixties learning how to drive would make a great subject for a movie," you probably aren't alone. And now that the idea is planted in your head, if you think that such a thing actually sounds pretty boring, you're not half wrong either. Surprise, surprise, such a film actually exists. The 1971 Italian feature The Automobile (L'automobile) stars iconic movie star Anna Magani (Rome Open City [review], Mamma Roma) as Anna, a well-regarded prostitute in her 60s who has never owned her own car. Despite having such high regard in her social circle that her friends and colleagues refer to her as "The Countess," Anna is bored with her everyday existence. Why should a woman of her age continue to schlep around on the bus when having her own convertible will grant her freedom to come and go as she pleases? As the idea grows, she realizes that this could be her liberation, and eventually takes the plunge. The first third of The Automobile is Anna trying to decide whether she wants the little yellow car or not; the second third is her learning to drive and getting her license; the last third is her first trip as a woman with her own wheels. This outing to the beach introduces her to the new social possibilities provided by having a car. When she meets a nice family at a gas station, it gives them something in common to talk about; when she meets a couple of opportunists at the beach, it shows her how having transportation can get you taken advantage of. 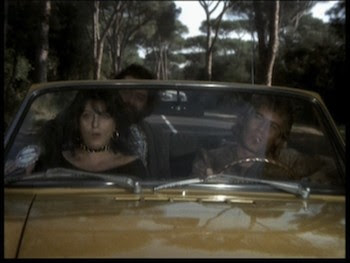 The Automobile was written and directed by Alfredo Giannetti, best known for the screenplay to Divorce Italian Style. His visual approach has much in common with Italian Neorealism. He shoots on location, in the streets and cafes of Rome, photographing Magnani walking the pavement amongst genuine passersby. The narrative has the tangential flow of real life, both to the good and the bad. The movie is at its best midway when Anna is dealing with the frustration of learning to drive and dealing with the off-beat personalities that hold the keys to her dreams. 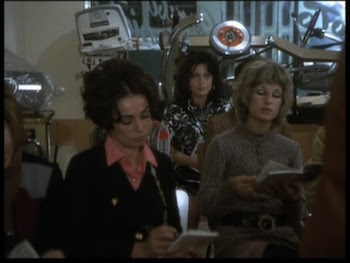 When the older woman is alternately berating and charming the DMV employee taking her license photo, we are reminded of what a force of nature Magnani can be. Suddenly, all the men who have been hitting on her from The Automobile's very first scene make a lot of sense: Anna Magnani is a forceful personality, a woman used to being watched and admired, but who also gets her own way. Her comedic chops are particularly evident when she realizes the official giving her driving test is a former client. Perhaps the movie's best touch, though, is the ongoing conversation Anna has with herself. This manifests as both a voiceover and Anna speaking out loud. At times, it practically becomes a dialogue. Giannetti shows impeccable timing for moving in and out of the interior and exterior. To capture an unbroken cut where Anna responds to her own thought processes aloud shows the director had an impressive command of the scene. Too bad not everything in the movie works as well. Long stretches pass without much of interest happening. Too long is spent on the decision phase of the story, and the debate grows tedious. This isn't helped by the drab photography by Pasqualino De Santis (Lancelot of the Lake, Death in Venice). The downside of the realistic approach is that we're stuck with the unattractive early '70s fashion and the earthy color palette popular at the time. This aesthetic is only reinforced by Ennio Morricone's kitschy store. The music never maintains a consistent style, pinging between classic orchestration and contemporary noodling. It's amazing how a modern musical style, which can seem so cutting edge on release, can cause a movie like The Automobile to age so poorly. I'll admit, I was mostly charmed by the middle section of The Automobile, and by the time Anna does finally hit the highway, I was happy for her achieving her dream. That said, I was nonplussed by the ending, which leaves Anna in a bad place. Gianetti has pulled a bit of a rope-a-dope on us, and what looked to be an uplifiting story about an older woman finding a new lease on life turns into a total bummer. Maybe had I enjoyed the build-up more, I'd also have felt this turnaround more intensely; instead, much like Anna, I am left wondering why I even bothered if this was all that was going to come of the endeavor.